An oft-quoted statistic is that you only need about 20 stocks to make a well-diversified portfolio. Here I attempt to quantify the benefit of diversification. The result is that losses due to portfolio concentration are still quite high at only 20 stocks. Meir Statman wrote a useful paper called How Many Stocks Make a Diversified Portfolio? In it he gives a table showing portfolio volatility values for varying number of stocks in the portfolio. The data is based on the portfolio having equally-weighted stocks. From this table we can simulate a 30-year portfolio to see how much more volatility drag there is on returns for concentrated portfolios. I assumed that an investor would start with a lump sum and invest for 30 years. I set the starting lump sum so that a portfolio owning all stocks would finish at $1 million. The following chart shows how smaller numbers of stocks fared. I call the difference between a portfolio of all stocks and a more concentrated portfolio the portfolio “concentration gap.” We see from the chart that the gap at 20 stocks is about $140,000, which I’d call quite significant. So, why do so many people think that 20 of fewer stocks make sense? The answer is that they believe they can pick winning stocks. All of the above analysis is based on a random selection of stocks. 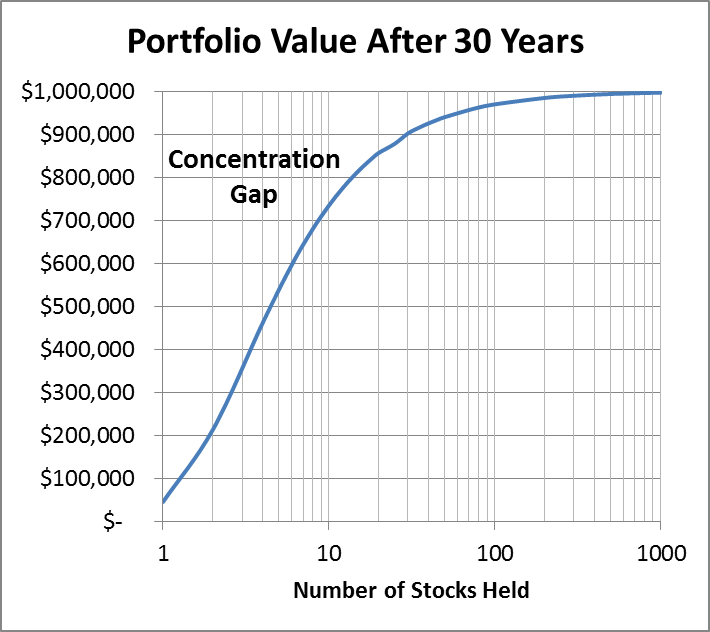 If you can choose above-average stocks, then you can overcome the concentration gap. Of course, the vast majority of investors (but not quite all) who believe they are great stock-pickers are actually deluded. The main takeaway from this article is that it isn’t good enough to have some stock-picking skill. You need enough skill to jump the concentration gap. If you have the talent and energy to find 20 above-average stocks, you need to be able to overcome the concentration gap and any other costs you incur that index investors would not incur. Not everyone is investing in an attempt to maximize their returns which can be another reason why some prefer to pick individual stocks. The comparison leads me back to another question I haven't found the answer to yet. Since you study index funds you may already know the answer. If someone buys say 1000 units of an index fund and holds them for 30 years what happens to their holdings when the index changes due to companies going bankrupt (Enron; Nortel) and being removed and new companies being added to replace them? I would think the index fund managers would have to writeoff the losses and spend new capital to acquire the new holdings. Where do they get the new capital? Do they increase the MER? Does it come out of the distributions? And how is the cost of this changeover reflected in the historical data available for, say, the TSX? Do you have to find a TSX index fund that has stayed essentially the same for the past 30 years to see accurate history adjusted for these extra costs? If so, are there many funds with that length of history? I know the BMO index fund I bought in the 1990s morphed 3 or 4 times before I sold it in the 2010s changing from a true index fund into some higher fee crap. I can see how you can estimate your total commission costs and the total value of 20 specific stocks at any time during the 30-year interval but I'm not sure where the numbers come from to do the same for the entire index. When the index fund is updated, the weights have to add up to 100%. If it's a total market index and a company goes bankrupt with no new companies to replace it, then the other holdings stay the same and the weights are changed so they add up to 100% again. In every other case new companies will be added from time to time. In theory a bit of every other stock would have to be sold off to buy the new company. A good index fund manager will find some way to do this that minimizes trading costs and taxes such as using new deposits to buy the new stock. @Bet Crooks: I've never met any stock pickers who weren't trying to beat the market. Some say they aren't, but then they go on to say they buy better than average stocks, which just means they think they're picking stocks that will beat the market. Index funds aren't completely static in their holdings. The stocks that make up a particular index change from time to time, usually using some mechanical criteria. When a change occurs, index funds do some trading. This trading may involve selling a little bit of every stock to make room to buy a new stock. They don't increase the MER to add a holding. Distributions seem fairly steady for most index funds. Historical index data reflect the actual performance of the stocks that make up the index. So, if a particular stock gets dropped and a new one added, the poor performance of the dropped stock pulls down the index level a little. All these remarks are for what I think of as true index funds, like those offered by Vanguard. I don't know what funds do when they aren't constrained by the usual actions of index funds. The total costs from owning index ETFs over time is both low and predictable for buy-and-hold investors. You pay your $10 or so commission on each trade. You pay the hidden spread costs that apply to any ETF or stock purchase. The low MER is paid every year. For taxable investors, there are taxes on dividends, and there are often some tiny distributed capital gains. Thanks Richard and Michael I think I understand it better now. I guess if the fund managers work it carefully they can pick up the newly listed stocks using mostly new capital coming into the fund from new investors etc to minimize churn. As for stock pickers who aren't after max gain, there are quite a lot of us. My grandmother was one; several of my relatives are others; and some of my friends. The most common reason is looking for a source of income which is higher than fixed income but not very risky (e.g. a bunch of my relatives own a bit of BCE and some banks. They know that they won't see big capital gains from these old stodgers but they feel they are reasonably "safe" which is very important to them and the dividends they generate are significant. They are definitely "buy and hold" investors who likely will pass on the stocks when they die. (My Mom still has my grandmother's bank stock, and I expect one of us kids will have it next although hopefully not for a very long time yet.) They tend to see blue chip stocks as a type of liquid annuity. The other set would never buy a mutual fund of any type because they literally despise certain types of companies that are listed on the exchanges. They tend to foam at the mouth the most about cigarette companies, alcohol and brewing companies, war-related companies, and of course the infamous tar sands. They consider any investment in those companies to be abetting the enemy. To them, the rate of return is secondary to their opinions. I guess it may be that you are referring to a subset of people who buy individual stocks when you use the phrase "stock pickers?" @Bet Crooks: If someone believes a stock isn't risky, he or she believes it is better than other stocks. If this person is actually correct, he or she is beating the market at a given level of risk. Even if you don't have the phrase "beating the market" in mind, choosing BCE and bank stocks because you expect better results than picking other stocks, you are trying to beat the market (at your perceived level of risk). Of course, a portfolio with BCE and a few banks is far riskier than many people believe. Big established companies that have been around for a long time do fail -- think of Nortel. I've never met someone who claimed to deliberately choose inferior stocks for moral reasons, but no doubt there are such people around. I've met a few people who avoid certain stocks for moral reasons, but they believed they would get better than average results. I would actually have more respect for the person who knowingly chooses inferior results (for moral reasons) than I have for those who delude themselves into believing they can pick superior stocks. How is that gap calculated? Randomly selected stocks? @Richard: The gap is calculated from the median results of randomly-selecting stocks. However, most of the work was already done for me in the Statman paper where he listed how portfolio volatility varied with the number of stocks. From that I could calculate the volatility drag on expected compound returns. A simpler way to illustrate the benefits of diversification is to start by imagining there are only 3 stocks whose returns are -10%, 10%, or 30% each year. The problem is that which stock gets which return changes from year to year. One option is to just divide your money equally among the 3 stocks and make the average return of 10%. So, after 3 years you'd have a 33.1% return. If instead you choose just one stock each year, the median result is that you'd get -10% one year, 10% another, and 30% in another year. The final result is 0.9*1.1*1.3-1=28.7%. This gives a concentration gap of 4.4%. If you choose to own two stocks instead of just one, the median result is to get average(-10%,10%)=0% one year, average (-10%,30%)=10% another year, and average (10%,30%)=20% another year. The overall return is 1*1.1*1.2-1=32% for a concentration gap of 1.1%. All this is based on median outcomes. Of course, you might get lucky and pick the 30% stock each year. Or you might believe you have some ability to pick better than average stocks. Wouldn't the long-term return of the average single-stock portfolio be the same as the long-term average return of all stocks (ie the index)? There would be a much wider distribution of results of course. Investors who happened to own a poorly-performing stock would probably be more realistic about the cause than those who happened to own one that performed well. @Richard: This is true of average returns but not median returns. For example, Cultural Geography majors at the University of North Carolina in the early 1980s went on to achieve fantastic average lifetime earnings. The problem is that Michael Jordan skewed the numbers. The much more relevant median earnings were far less spectacular. That makes sense, but if the chart is based on higher volatility causing lower returns I'm still trying to understand that. Doesn't that mean that bonds have higher returns than stocks, small caps have historically under-performed the broader index, and reversion to the mean is a great theory that has never been observed in real markets? Again I can completely understand a wider spread of outcomes. But that's related to the end point, not the path taken to get there. @Richard: There are two factors to consider. The first is the expected return in a year. The other is the volatility. You can think of the volatility as a kind of drag on the expected return to give the median return. Because stocks have a higher expected return than bonds, even after stocks are dinged by more than bonds for their higher volatility, they still give better long-term returns than bonds. If you do the math on those figures, you'll find that the expected final outcome is still $1000, but the median outcome is $990, a 1% loss. Focusing on the median outcome is the minimum rational level of risk aversion in most cases. Most people are actually more risk-averse than this. I've read Statman's paper, and it has virtually no relevance to your own argument apart from the fact that you also want to encourage more diversification. "Concentration Gap"? Really? What would Statman say about your use of median as opposed to averages? @Jin Won Choi: I've been polite for several of your incorrect assertions about my work. I've lost my patience. You've been wrong in the past and you're wrong now. If you can get Statman to comment, I'll listen. Your comment amounts to saying that volatility doesn't matter. Volatility matters, but because it drags down expected returns. I'll write a blog post on it sometime. @Jin Won Choi: Volatility does not affect expected returns, but it does affect expected compound returns which is what long-term investors should be concerned about. Here's my analysis. And when you use averages, there's no evidence that compounding punishes concentrated portfolios, and I didn't even get into the fact that you shouldn't model future stock returns using normal distributions. You should at the very least use lognormal instead, which will behave differently to compounding. @Jin Won Choi: Of course you see no difference when you use only arithmetic averages. But if you use only arithmetic averages, you should be willing to toss a coin for everything you own if the payoff is a little more than everything you own. I did use lognormal distributions. Otherwise there would be no difference between the median and arithmetic average. Thanks for coming out.